Only 3 days left of Tim's tags. sigh!! I'm sure myself and others feel the same way - we'll hate it when it ends... But alas all good things must end. So although I do some of the background technique that Tim's using today, I do it with embossing folders, and Tim has gone a step further - of course. Inked up my stamp (Impression Obsession CAC Holly) with Distress Evergreen Bough and stamped onto my manilla die cut tag, clear embossed. Sponged Festive Berries all over and sprinkled with clear embossing powder and tapped of a lot of excess powder and brushed a little off as well, clear embossed. Now because of the tapping off and brushing some off, there is little to no embossing in areas for the next step to be effective. Sponged Gathered Twigs heavily onto tag. ( did a 2nd tag using more of Ted's color scheme and the background came out much better (practice make perfect). Inked direct to paper with the twigs pad onto white cardstock and embossed with Distress "Old Paper" and "Vintage Photo" giving a more twig color look. Die cut with Tim's "Branch Tree". Brushed off excess powder. Added Aleenes "True Snow" and sprinkled with Ritz micro fine glitter "Warm Highlights". Set aside to dry. Die cut the small bird (Spellbinders "Bird Sanctuary") from white cardstock. Inked up a bird stamp (Martha Stewart wood mounted 2 bird set) with Tombow markers, misted with water and stamped on bird die cut (it fit almost perfectly), then moved the color around a bit with my waterbrush. Used my electronic cutter to cut out the birdcage twice, then adhered the two together to give a thicker profile. Applied Versafine Black Onyx all over and embossed with Rustique Antique Jade and Marcasite embossing powders. Also cut out the word "Tweet" using the George Basics cartridge, applying Viva Perlen Pen "Lemon" all over the letters then sprinkling with Pro Art Glitter "Crystal". 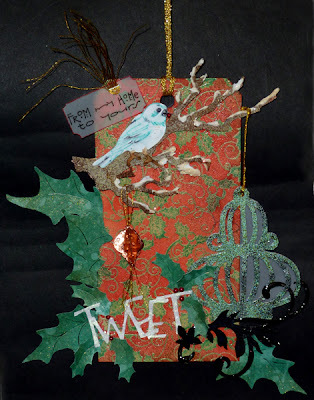 Direct to paper with the Evergreen Bough over white cardstock, then added Pine Needle and a touch of Gathered Twigs. Misted with water, dried, misted with Perfect Pearls "Sunflower Sparkle", dried, punched out with the larger of the Punch Bunch Holly" punches. Also cut some out with my electronic cutter. Die cut the flourish (Spellbinders "Floral Flourishes"), inked with the Black Onyx and embossed with black embossing powder, then coated with Glossy Accents. Die cut the smallest Heirloom Ornament (Spellbinders) from copper tape (Lee Valley slug tape), embossed them with the Cuttlebug "Swiss Dots" folder, scored down the middles, folded them, removed the liner and adhered them, half of one side to half of another side. 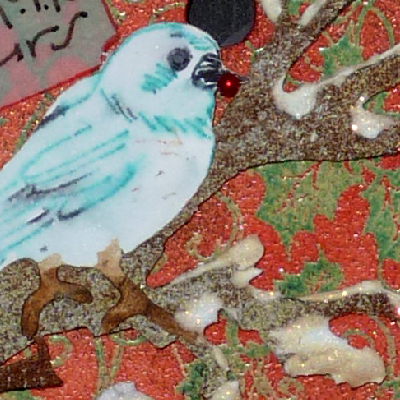 Added a gold thread string for hanging and adhered the last ornament. I now have a 3D hanging ornament. The last item was the little tag on the top left side. Wrote in my words on a piece of translucent vellum, punched out with a large punch, scalloped the corners with a hole punch, colored the edges with a red Zig Writer. Attached to card with the mini attacher including a few strands of the gold thread. Pop dotted the tree branch and adhered everything else, adding some red half pearls on the holly and one in the birds mouth. Tied a gold cord for hanging. added a piece of the vellum behind the birdcage, I found it too bare without it. It's another tag I'm happy with Tweet, tweet!! We were of the same mind today, Yogi! I too used a bird as my main image. Your tag has so much depth to it. I love all the different elements that you used. I too will be sad when the 12 Tags end. I have enjoyed seeing everyone's interpretation of Tim's original ideas. Yogi: This tag is wonderful--your bird is perfect. Glad you visited us at Simply Create Too and entered our Embossing Challenge. Hope you get to enter our upcoming challenges, too! Now that's what I'm talking about!!! Fabulous! Way to work out of the box! Super creative. Wonderful Tag Yogi! Thanks for sharing it with us in the Holday Spirit Challenge at Dude Time Doodles! Very impressive project, I really like it! Thank you for sharing this with us at stamps&fun=CREATIVITY. Wow, your tag is absolutely gorgeous! Love the vibrant colored background! Thanks for joining this week's challenge at Dude Time Doodles. Amazing tag and so much wonderful details. 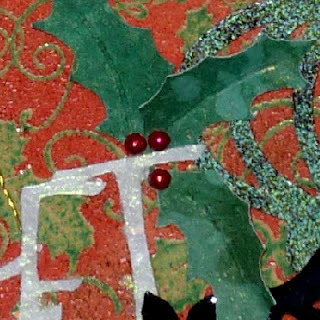 So glad you joined us for the Holiday Spirit challenge at Dude Time Doodles this week. Fabulous! I love to see everyones creations during Tim's 12 days of Christmas. Thanks for sharing and joining us for a challenge this week over at Frosted Designs. Beautifully done. Love all the different elements. Wonderful tag - well done on all the techniques, fab details! Thanks for playing at Dude Time Doodles! Brilliant tag I like all the different elements and the colours, Thanks for playing along with us at Dudetime Doodles this week. Such a beautiful tag you made.. Thanks so much for playing along with us at CCCB! Beautiful details on your tag, and I love the woodsy elements! 3-D glitter is very pretty! I hope you'll join us again at Frosted Designs! I've really enjoyed following your tags...gorgeous! Thank you sharing this one with us at Dude Time Doodles this week! Ohhhhhh so LOVELY! Thanks for joining us this week at CCCB!! Thanks for the close ups and detail. Your tag is outstanding and what a fun keeper! All of your tags are.